Another completed project - yay! I'm on a roll! This quilt went together pretty fast. I started it July 7 and it was finished by July 15. This is a baby quilt for my cousin who is expecting a boy in August. She requested blues and greys. What a fun color combo! I mentioned how quickly I completed this project. The top only took a few hours - just two days at my machine! After another few days break, I layered and pinned it in one night and then spent a Saturday quilting it. I used an overall meander. Here's a photo of it before I added the binding. Now it's ready to be shipped to Battle Creek, just in time for baby Owen's arrival! You may have noticed all the quilting activity on here lately. Over the weekend, my mom came to visit. She requested a quilting weekend and I was happy to oblige. Combined, we finished two quilts, got another one ready for binding, and made three quilt tops. It was a productive weekend! A few years ago, I completed a Mystery Quilt while attending Camp Tecumseh. After making all the blocks, I didn't really like the last border that was supposed to go around the quilt top. It made the top too big for a baby quilt but not big enough for a decent sized throw. So I decided to complete the quilt without the border. I blogged about it here. Since I already had the border blocks made, I decided to put them together to make a smaller wall hanging/baby quilt. The top was easy to complete but I didn't have a reason to finish the quilt -- until I bought my new sewing machine in January. I was eager to quilt something and I wanted to start with a small project to practice on. The machine sewed beautifully and now I have another finished project to check off my to-do list. Back in 2009, our Covered in Threads quilt guild organized our very first block exchange. One of our members had participated in a block and white block exchange with another group of quilters so we thought this would be a great way to get started on what has become an annual challenge. Here are the blocks I completed for the exchange. We all chose two blocks to make and then we got together and did the exchange. Ten people participated so we left the meeting with a total of 20 blocks, measuring 12.5 inches. I even blogged about some of the other blocks our members did. Check out one of those posts here. But despite my excitement about the exchange, it took me a while to do anything with the blocks. I finally added wonky sashing and put them together during the 2012 January Quilt Camp. Eventually I added a red print border that I found on sale at Jo-Ann's. But I didn't like the geometric print against the sampler blocks so the quilt top sat in my unfinished project tub for quite a while. Finally this spring, I pulled it out and was talking with my mom about it. She suggested we finish the quilt for my cousin who had recently graduated from college. She agreed to change the borders and pin the quilt if I would do the quilting. She would then finish with the binding. It was a great deal for me, especially since it meant I would finally be able to cross this quilt off my to-do list. We finished the quilt this weekend. I'm glad we fixed the borders! I get significant pleasure with making quilts and giving them away to joyful recipients. 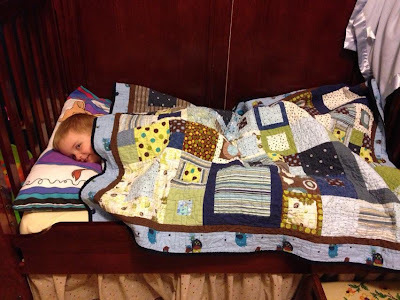 This is especially meaningful when A) the recipient squeals with joy or ooh's and aah's when seeing it the first time, B) the quilt shows up in a photo shoot, and C) when I find out the quilt is actually being used. So I thought I'd do a quick recap of some of my quilts in the every day world. Elephunk showed up on Facebook recently. And Ryleigh's Quilt often shows up on her parents blog. My friends seriously have the cutest kids ever! They make me almost want to have another myself. (Not really but I'm happy to get to spend time with theirs.) At least one of the children in these photos will soon have a new sibling so it looks like I better get going on another baby quilt! My dad and his wife recently built a new house on their property at Crooked Lake. It's beautiful and along with the new house, they furnished it with a lot of new furniture. Including a new bed for their master bedroom which happened to be a California King. (In case you don't know, California Kings are HUGE!) So for Christmas, I gave them a personalize coupon for my quilting services. But I knew how much a quilt would mean to them and I wanted to make them something to match the decor of their new lake home. They were very excited about the present except that my dad stressed he wanted the quilt to be big. To fit his big bed. Like big enough to hang over the edges of the running boards and tuck his pillows in. The largest quilt I've ever made was queen sized, about 115 X 110. But armed with my trusty new sewing machine (with 10 inch harp space!) I was confident that I would be able to quilt this monster of a quilt - all 130 X 120 inches of it. My dad's wife picked the colors and pattern - Floating Squares from the Piece of Pie Layer Cake Friendly Quilt Patterns book. Luckily I had access to the pattern and though I didn't have layer cakes, I had lots of brown and green scraps to make the quilt. I only had to purchase fabric for the borders and backing. I always wash my quilts before giving them away. I love the crinkly look! With this quilt being so big, it took several cycles in the dryer so it's extra crinkly for now. Those wrinkles will smooth out soon. Usually I have someone hold up my quilts for photo opps but this quilt was so big and heavy - I can't believe how heavy it is! - that I ended up just taking photos of it on the bed. Here's a close up of the decorative stitch I used in the borders. I should have taken some photos of the quilting in the top; oops, I didn't think of that. I like the decorative stitches - and my fancy machine has over 250 - but I probably won't use them very much. They are pretty small and don't show up well. But it's still fun to play with them every once in a while. The quilting I chose for the top was an overall continuous right angles. The chevron border has zig zag quilting. I was nervous about quilting such a big quilt but it went really well. I would estimate that the top (without the borders) only took about 6 - 7 hours. Not bad for such a big quilt! I did have to piece the batting which wasn't fun - there was so much of it. Laying it out to baste proved to be a difficult. I felt like it was too big for my kitchen table. And the thought of pinning it all over was dreadful. (Because it's so big!) So I decided to use 505 basting spray that I learned about in Rachel's Stitched in Color Blog. Only I didn't have any place in my house to lay out the quit. (Because it's so big!) So I took it to work with me one day and commandeered a conference room. Some friends helped me lay it out and we were able to baste it in less than hour. I will definitely use the basting spray for other quilts but luckily, my next few projects are baby quilts and wall hangings.